Divider kits are designed to be added to a standard 6U or 9U subrack which then converts to accept 3U and 6U PCBs within a 6U or 9U Subrack . Further separate divider accessories are available which allow 3U, 6U and 9U PCBs within a 9U subrack. A divider plate allows the subrack to be divided horizontally which then accepts part width horizontal rails divide that portion into 2 x 3U. 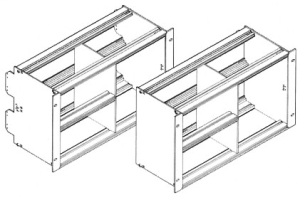 Where heavy loads are being installed, the divider plate can be locked to rails top and bottom using retention keys which screw to the plate and slide into the rail extrusion, preventing rail deflection. The keys are easily fitted before or after assembly. The subrack is divided without loss of useable front panel area and can be arranged with the 6U section to the LH or RH side . When selecting the required handing, please check component height on PCB adjacent to divider to ensure required clearance is maintained. Divider plate made from 2,5mm aluminium alloy which is satin anodised to BS1615 AA10. Horizontal rails are extruded aluminium alloy, punched on a 5,08mm pitch for guide rail location and threaded at each end after anodising. Rails are fixed each end with a single M5 fixing, countersunk at the divider plate and pan head on the sideplate. To ensure continuity the pan head screws are earth nib type which breaks the anodic coating and the countersunk screws fit into countersinks machined after anodising to give an exposed surface. 2 x 3U, 84HP version.